Regardless of how often you jump online, it’s a fair bet that you’ve noticed the deluge of websites vying for your time and money. These come in all shapes and sizes and to varying degrees of quality, but does bigger always mean better? How do the smaller websites compete against their larger cousins? One particular area of web creation that has surged in the last few years is that of the microsite. The clue is largely in the name, as a microsite tends to serve as a small, standalone website that performs a very specific function, whether that’s selling a unique service or presenting an opinion. In the article below, we go into further detail to explain what a microsite is, why it’s a modern tool worth considering and how the best ones are used effectively. Microsites are especially good at delivering concise bites of information on their own terms, largely due to the high popularity of the smooth scrolling one-page website and the advantages that format brings. While not without drawbacks, these can excel in drawing the visitor’s eye and pulling their attention down the page, divulging information at speed before concluding with an impactful call-to-action before the visitor’s interest has had a chance to waver. The one-page website is probably the most common form of microsite you’ll see and is proving itself an effective way to increase engagement. Having all the information in one place naturally lends itself to a positive user-experience, with content that’s easily swiped on handheld devices, as long as your site has been well optimised. Owning a microsite is best seen as an opportunity and one that you’ll want to take full advantage of. By telling the story of your product or service in a fast and digestible way, you’re presenting your company as an easy choice that requires less effort from the prospective client than much of the competition. Couple this with a fast-loading video background and some clever colour use (as seen at Angove Partners) and you’ll soon have a Microsite that resonates with your clients. Microsites have become such formidable contenders in 2018 in part due to the unbridled creativity they tend to offer. The freedom to engage with an audience in a way that a heavily branded, inflexible website can’t is invaluable in today’s world of instant-loading and flaky attention spans. Even if your company’s website is new, responsive and attracting decent clientele, that doesn’t necessarily mean it will serve every function. Should you decide to run a competition complete with user-submissions, host a short film contest or push a hot new product that requires extra marketing, you might discover that your core website simply isn’t up to the task and something special is needed. This is where a microsite can work wonders. A successful microsite will have been designed with a core goal in mind and a relatively modest cost involved, with a negligible risk due to its standalone format. In essence, microsites serve as a way for companies to attempt a new approach that won’t compromise the core brand. With their small size, attractive designs and highly focused content, microsites are perfect candidates for social media sharing. After all, it’s much more likely that you’ll take note of a tweet or post that resonates with you on a personal level than the attempt of a broad promotion without that all-important hook. Microsites usually target a specific audience and can do so wonderfully, as long as you understand how to grab them quickly and keep them engaged. It’s also worth noting that cleverly designed and easily shared content on a microsite has the potential to go viral. 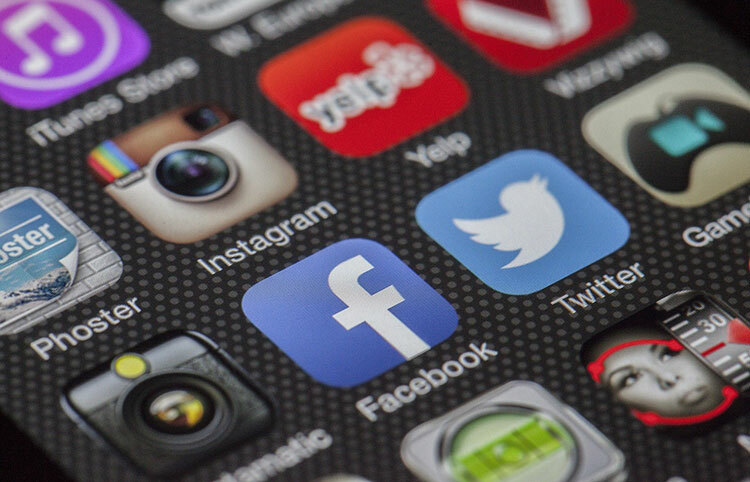 Even if your content isn’t of the viral kind, you can be sure that a bite-sized but fully optimised site will get its message across and prove memorable enough to make an impact. So far we’ve covered why a microsite might be used as a secondary website, but it’s also a fantastic option for small business owners or someone looking to remove old information from their online presence. Sometimes it’s better to start out small and avoid a hefty website build from the outset, with page upon page of half-considered information that’s been poorly designed and no one ever sees. Having a microsite instead can help you really double down on what it is you want to say and whom you wish to reach. You can always build more pages if needed; serving up only the content that you feel is required to market your business effectively. 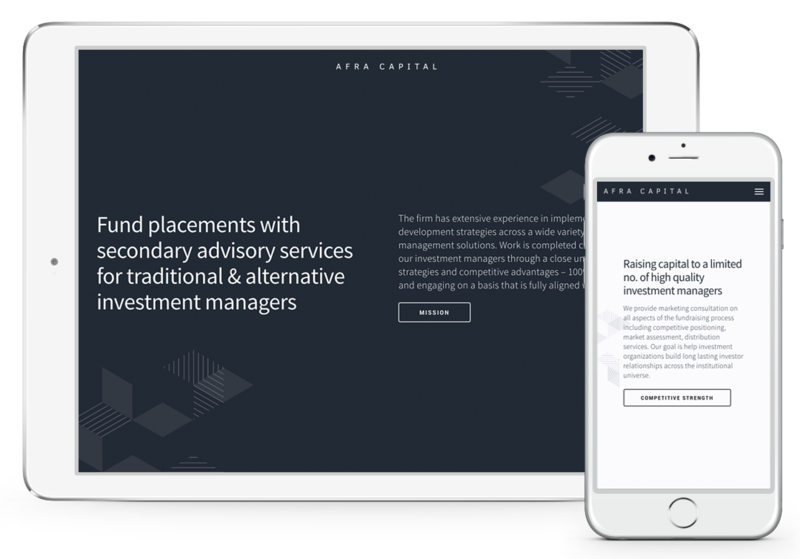 The microsite we created for Afra Capital was designed to stand on its own merit, build legitimacy and serve as a referral tool rather than be used for point-of-sale. Without a huge number of pages to populate, it could avoid the typical imagery associated with financial web design, such as cheerful business meetings and angled glass windows. Instead, its unique look is earned with smooth scrolling functionality, brief animations and contrasting backgrounds. Reactive Graphics has designed and developed a number of great microsites that load quickly and attract the top clients. We love the smaller jobs as well as the larger web projects, so please get in touch today to discover what we have to offer.